Student groups visit the Playhouse arts complex, see a professional production, participate in an interactive Q & A with cast and crew and take a backstage tour for an arts education experience that allows them to test new ideas, use their imagination and discover how to use the creative process to enhance such study and communication skills as teamwork, imaginative problem-solving, decision-making, leadership, conflict resolution, research, language arts and meta-cognition. Each theatre field trip also includes an activity booklet, certificate of participation and free tickets to a future performance for each student, as well as a teacher’s manual, and consultation on how to apply theatre skills across all curricular fields. “Thank You so much for the awesome field trip!!!! The children enjoyed it so very much. For many it was the first time ever seeing a live play. You were all so very kind and welcoming. More than critically hailed explorations of classic children's literature, more than internationally acclaimed musical comedies, these productions, each presented before more than 50,000 audience members to date, offer young audiences access to positive role models and social and personal values, as well as a wide variety of theatrical and musical genres, through the use of familiar stories, world-class performances, inspiring music and colorful word play. 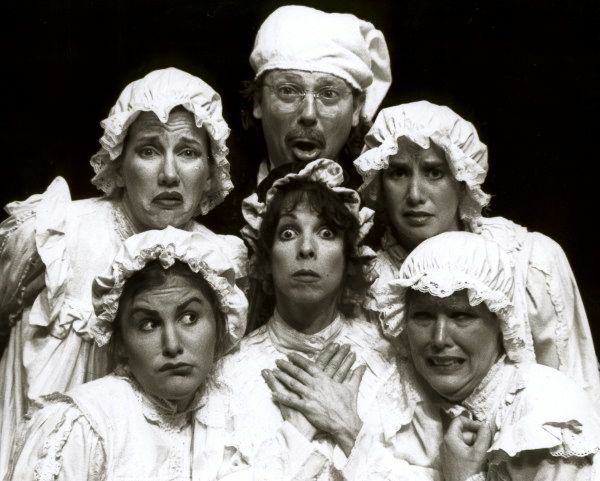 Mounted with authentic and professional costumes, props, sets, make-up, lighting and sound, the plays deal with contemporary issues in a theatrical manner, couched in a historical setting, and are presented by Actors' Repertory Theatre, Santa Monica's internationally acclaimed professional acting company. 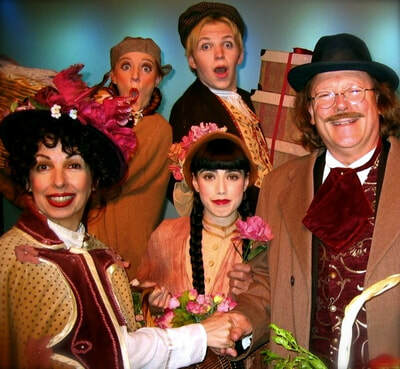 Santa Monica Playhouse is proud to be listed as an approved program on www.LAArtsEd.org, Los Angeles County's one-stop-shop for quality arts education programs. Productions are presented in one of two Santa Monica Playhouse performance auditoriums. You may book one or two performances of the same play on any week day beginning at 9am or later. Field Trips generally run two hours (includes a one hour and a half hour performance, with a short intermission, and a Q&A after the show.) Workshops following the performance are also available. Great news! We receive funding for a major portion of your Field Trip. The actual per show cost is $1575. Cost to your school is only $695 for one show or $975 for two shows on the same day. In some cases, further funding is available - please ask. Below is a list of currently available productions. To find out what is playing when, please get in touch (email us!) Shows are available 52 weeks a year. 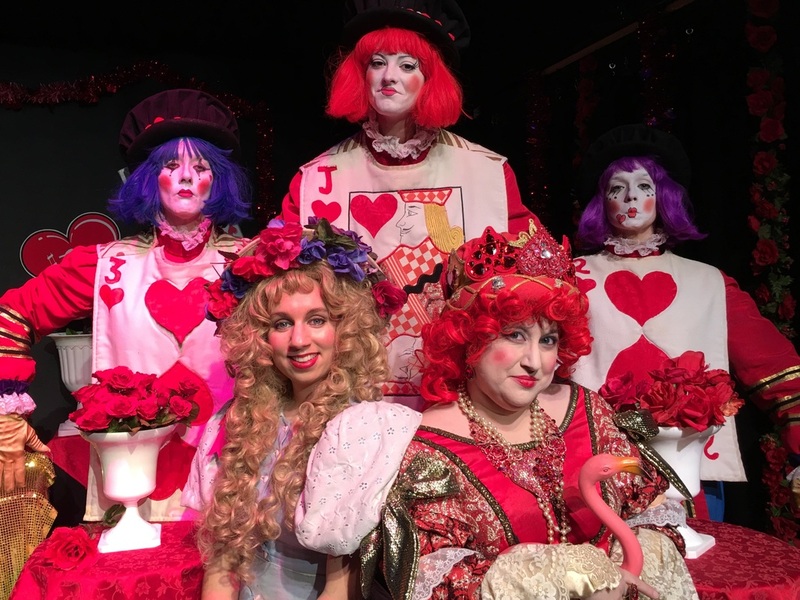 Alice returns to Wonderland at the invitation of her old friend, the Queen of Hearts. Once there, she finds that things are just as madcap and nonsensical as ever. 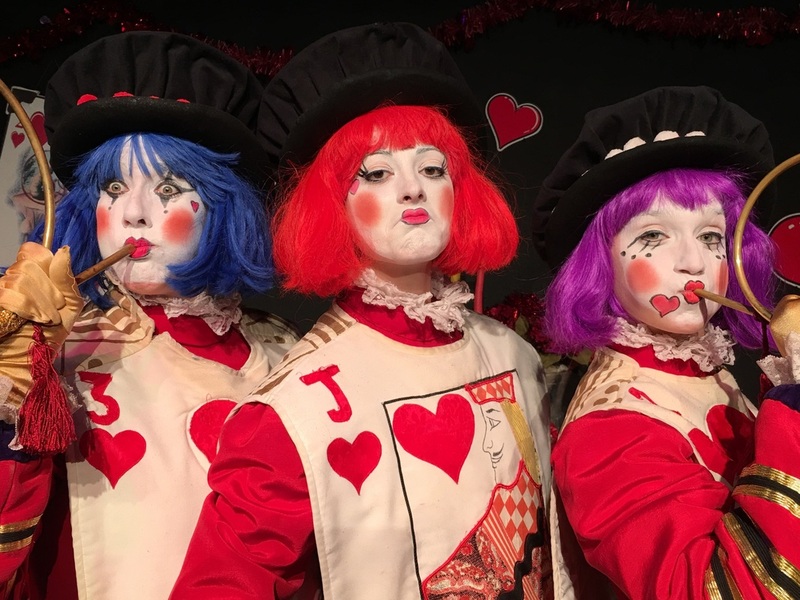 Tweedle Dee and Tweedle Dum, the world’s most famous enantiomorphs (and yes, the word is discussed and explained in a delightful musical number) have eaten all the food for the tea party, and the Queen is furious. Alice is put in charge of producing refreshments, and this takes her on a delightful excursion through the world of puns, word games and linguistic jokes that Lewis Carroll so intriguingly created. While attempting to fulfill her duties, Alice comes upon the Cards, who, of course, have planted roses of the wrong color. As they try to paint their way out of the corner, they sing a merry ode which introduces students to such varied artists as Escher, Van Gogh, Titian, El Greco, Grandma Moses and many more. The roses are still unfinished when the Mad Hatter arrives, saving the day with his supply of tea-“Prosperi-tea for the wealthy”, “nobili-tea for the Queen”, “mobili-tea for those who can’t sit still in their seats.” The golden afternoon ends with a special surprise un-birthday celebration for Alice, and the promise to meet again soon. Lewis Carroll, famed mathematician and author of the classic “Alice” books, filled his stories with the most interesting of puns, word games and tricks with which to delight his young admirers. These have been faithfully transferred to the stage in Alice and the Wonderful Tea Party, allowing students to discover the joy of language and rhyme in a colorful and entertaining manner. Children will have the opportunity to stretch their imaginations, as well as compare the differences between fantasy and reality, fact and nonsense, and discover just how many similarities there actually are between these seemingly opposite aspects of thought. Alan Eyerly of the Argonaut defines the Santa Monica Playhouse production of Beauty and the Beast as “a delightful family musical with a timeless message about searching for the beauty lurking within a beastly exterior.” Based not on the Disney cartoon, but on the original 14th Century legend, this is precisely what the characters and the audience learn. Family ties, seeing the good within every person, and the age-old yet ever new adage, “Beauty is in the eye of the beholder” are the important themes celebrated in this production. Audiences get a fascinating view of life in medieval times, with exquisitely detailed costumes and authentically reproduced props, are introduced to the musical theatre style of such shows as Camelot and Kiss Me Kate, and enjoy the interaction between a very independent Beauty and a gruff, but never scary, Beast. "You won’t find more professional theatre—for children or adults—anywhere in the Los Angeles area then at the Santa Monica Playhouse. Family theatre is but one facet of the Playhouse’s extensive repertoire, and its modernized musical version of Cinderella delivers fairytale enchantment, visual wonderment and flashing humor in a top-quality production. This Cinderella is a modern, independent miss who won’t allow the Prince to ‘look her over like a grocer’s tomato’. Cinderella’s witty sarcasm is lost on her stepmother and stepsisters, but not on the audience. The kids love it when Cinderella taps them on the head with her feather duster while she cleans the cottage. This charming musical comedy shows young people the importance of tolerance, and how to develop a positive self-image and interact successfully with others, both with their peer group and in the home, while discovering the dangers of stereotyping and the power of kindness and patience. 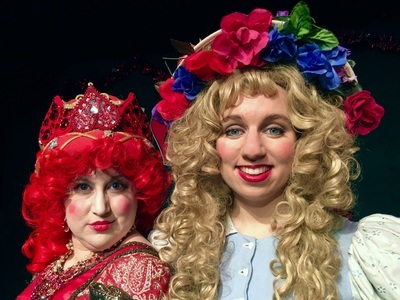 The stepmother and stepsisters are portrayed as humorous rather than evil, serving to increase children’s awareness that “stepmothers are people, too”. As in the original story, this version offers the philosophy that “it is not your financial or social status, but who you are on the inside, that counts”. Perhaps today, more than ever, this is a necessary belief for our young people to own. for our teachers to initiate a love of the arts in their students." "Students, teachers and parents raved about the play and found the cast delightful… wherever you perform the audience will leave satisfied they’ve seen quality on the stage." "An Enchanting Cinderella!…captivates its young audience, highlighted by fast pacing, fancy costuming and a lovely, unweepy Cinderella." Cinderella, Snowhite, Little Bo Peep and even Mother Goose confront the mysteries of modern living as they try to help the jaded teen Mary-Mary discover herself, find the lost Belle, save the fairytale world, and prove that you're never too old to believe in imagination, happily-ever-afters, and most importantly, yourself. Finding Belle gives us a whole new perspective on fantasy and reality, sharing and caring, and the importance of family togetherness. Audience participation adds to the enjoyment! The perfect way for young people to have an uplifting theatre outing, this fun, upbeat musical reminds us to believe in the power of imagination and relish in the chance to create our own happily-ever-afters. Finding Belle encourages us to make a difference in our world - big or small - with the help of some special fairytale friends. “Molly and her widowed mother have finally settled into Charlie’s Place, the old cafe they inherited. But the mortgage is due, and if they can’t come up with the money, greedy, villainous Marvin Q. Moneypost will take their land and throw them out. Molly glares at the statue of legendary sheriff Annie Oakley, whose spirit is supposed to bring them luck. “Maybe you didn’t really exist!” she blurts out. “Excuse me, did someone just question my authenticity?” The statue has come to life and is ready to come to Molly’s rescue. Annie Oakley and the Princess Café highlights the social, economic and emotional struggles which single-parent families so often encounter in today's fast-paced, bottom-line oriented society, and helps youngsters understand how those difficulties can be surmounted when parents and children, friends and neighbors, work together, instead of at cross purposes. It offers experiential choices, and gives youngsters a sense of self-worth, by showing how someone their own age can positively affect the family unit. Additionally, it highlights historical figure Annie Oakley, who was one of the first to fight for women’s rights and independence. "It really was an unbelievable experience for all those participating and I know it will be an unforgettable memory...a great learning experience and stimulus in opening up visions." A Visit with Sholom Aleichem introduces its audiences to one of the world’s greatest authors and humorists, Sholom Rabinowitz, aka Sholom Aleichem. It offers an enlightening view into American and European culture of the late 19th and early 20th centuries, and gives a colorful, informative tangibility to the exciting heritage of the man whose works inspired “Fiddler on the Roof!” Known in literary circles as “the Yiddish Mark Twain” (Mark Twain himself is said to have introduced himself to the famous author as “The American Sholom Aleichem"), Sholom Aleichem was a storyteller whose tales of the human condition speak with universal appeal. The lilting score is by internationally acclaimed composer Ben Weisman, who, in addition to his contributions to the world of theatre, wrote 57 gold record songs for Elvis Presley. “A Visit with Sholom Aleichem” is based on “Author! Author! 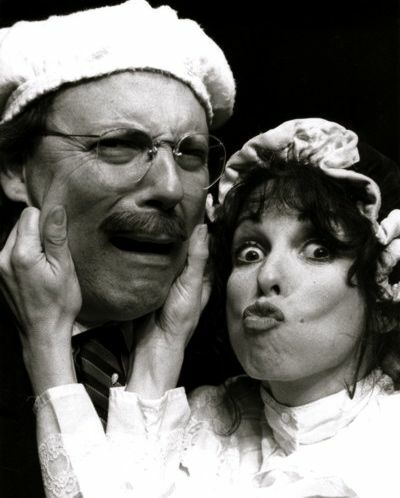 – an evening with Sholom Aleichem,” the longest-running Jewish musical in Los Angeles theatre history ( 4 ½ years in its initial run, and still the most requested Playhouse musical). This delightful, poignant and informative musical is part of our on-going Jewish Heritage Program, whose mission is to introduce today’s Jewish and non-Jewish youth to the unique richness of Jewish literature and theatre, and to highlight the importance of Jewish culture and tradition in our world community by presenting educational, enriching and enlightening theatre based on the words and works of Jewish authors and playwrights. Over 100 reviews! Over 100 raves!